Background: My informant was a Filipino immigrant who came to America when she was 12. She was born and raised in Manila before coming to America, her father seeking out new opportunities. She then got married and moved to Sioux Falls, South Dakota and currently works as a Denial Analyst for the Sanford Health Network, the largest hospital network in the Siouxland area. Main Piece: There are superstitious tales in the Philippines about beds of mushrooms and the mounds that they can be found on. It is that that creatures live there called the Nuno Sa Punso, a form of Duwende (dwarf). The Nuno Sa Punso live in the mound, and if you come across these beds of mushrooms, you have to say “excuse me” and “no disrespect to you all” (tabi tabi po). More accurately, it means something like “I mean no harm, please step aside, let me pass” although it is a bit hard to translate exactly. You must avoid stepping on it because if you make one angry, it will give you bad luck and spit on you. If you step on it or harm it in any way it will use its spit to grant a curse. If you are cursed you will get an incurable lesion type of condition that can only be healed by the Faith Healers. You may also vomit blood. The Faith Healers will usually warp the affected area in some form of leaves and oil while saying a prayer that asks for foregiveness from the dwarf you made mad. This is the only way the lesion will go away through time. According to the informant, this kind of folklore is a major part of Filipino society and often talked about because Filipinios are a very highly superstitious people. It was fairly common for her to hear about stories like this, especially involving spirits. My Thoughts: I think it is interesting because it shows a certain commonality in storytelling to teach children respect and also to ward them from staying out or straying too far into the unknown through the use of mythical creatures. I think that their “curse” is quite severe, and really would be something that would scare children. I wonder if it is somehow derived from some medical fact or otherwise medical incident long ago that was explained through spirits. Main Piece: The Manananggal is a vampiric creature that leaves half of its body and flies in search of its victims. The only way to kill it is to find the other half of its body, and kill the creature by putting salt inside of it. It is a hideous female that flies around one hunt after another preying on pregnant women. It will land on top of that hunt and use its long tongue that falls down the side. With its tongue it will go through the abdomen and eat the fetus of the growing child by sucking its heart. It hunts from village to village like so until it is killed. This story is told mainly through horror films in the informant’s experience, but it is quite well known because of this. Performance Context: According to my informant, the story originates from the area of the Philippines known as the Visayas. It is one of the three major groups of islands of the Philippines, being in the center. My Thoughts: I think it is interesting because this is another example of how horror really shapes the perception of people. This story itself may be older and written into older text, but it gains a lot of effect out of its pop culture nature. This is evidenced even more so by the fact that it is not really a story that originates from the entirety of the country, but from a specific portion. Thus, it gains attention through multimedia that does not know borders, so to speak. Background: My informant was a young American male. He is a game design student studying at the University of Southern California and currently works as a VR Design Intern at Gadget-Bot. Performance Context: According to my informant, he came to learn the story through viral media. Enough people had talked about it on platforms such as YouTube that he grew interested and looked into the story himself. Main Piece: In 2009, a comedy website called Something Awful launched a Photoshop contest to create the “biggest creepy pasta”. Creepy pasta is a internet term for scary short-form horror tales that originate and spread on the internet. As part of this contest, some people photoshopped an original creature into some old photographs from a newspaper. The newspaper articles make reference to several children who have disappeared or vanished. My informant says that this is so that the creature could be passed of as even more real. Because of the use of the newspapers, people of the internet started to believe in this creature who became known as Slender Man, for his tall, skinny figure. Slender Man has now become a legend about this mysterious creature with tentacles who comes, preys and steal children. He is a tall, slender figure with no hair, no face, and white skin. He is often depicted wearing a suit, appearing almost like a man in a morph suit with a business suit over that. Nobody knows why he does so as the origin comes only from photographs. Because people believed in the story so much as real, it spread as a viral internet phenomenon. Also, as a result, people began discussing ways to commercialize and spread the idea of Slender Man. Movies, games, short stories were produced en masse to explain this creature and his behaviors. One of the most famous of these is Slender: The 8 Pages, a horror game that became very popular on the internet through the game platform Steam. Sequels to the games and short films have also been produced and there are “even talks of a full-length feature film”. According to my informant, these derivative works are all a part of a large movement to “cash in” on the idea of this character. To them, they believe he was became so popular not just because people believed he was real, but also because to teh creature’s believers, how genuine and original he seemed. They said it was refreshing to see a story where the character seemed not only frightening, but also “genuinely original”. My informant says that people come up with myths all the time, but that a genuine modern myth that isn’t a rehash or remix of something else was interesting and made it all the more real. My Thoughts: I think it is interesting because it not only comes across the originality of ideas, but also the canonization and commercialization of these stories as products. To tell stories not only encourages the spread of those stories, but also the ways in which those that hear it want to capitalize and market that story in one or many forms. The way the story was turned from a photograph that had been photo shopped into all sorts of other media suggests that not only is the story can be spread in any or all formats, but that it can also be warped and changed to suit those need and strengths of those mediums. That the story itself has no need for origin as long as it retains the sense of originality and outside of that scope, can be warped to become whatever it needs to be to those that wish to indulge in that media. I think it’s interesting to ponder whether the original form of a story is necessary or perhaps that it might be just a stepping stone for the true potential of a story to deliver an experience to its viewers. It’s a sort of idea that suggests that mutation is inherently a part of the story and that variation should be encouraged rather than discouraged, unlike some other stories that we suggest should have a “proper”, “authentic” or “original form. Background: My informant was a young Filipino girl who was born and raised in Sioux Falls, South Dakota. She currently is a student at the University of Minnesota studying Double B.A. Global Studies and Cultural Studies. Performance Context: According to the informant, the students talk about it a lot and spread it among the academic populace. Main Piece: There are several student stories involving the stories of the statues around campus. One for example is that of the Platonic Figure. 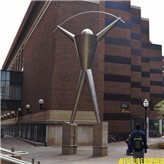 The students believe that if you walk under the Platonic Figure, you will not graduate in four years. Thus, the circle around the statue serves as a barrier that students walk around for fear of passing under the statue. Another statue that brings the opposite kind of luck is the Goldie Statue. The students say that if you rub the gold teeth and make a wish, it is good luck. A lot of students tend to come to this statue just before finals to give them a bit of extra good luck. Another time that they do this is before football games to “give the Gophers luck”. To the informant, the stories are told because everyone wants to pass their classes. No matter the logic, everyone wants to cling to this mystic notion and give something as silly as making a wish in order to give them any edge that they can. The informant doesn’t believe in the Goldie myth as much as the Platonic Figure story. According to her, it’s less about believing and more about not taking the risk. My Thoughts: I think it is interesting because it talks about how we form cultural ties within our own smaller communities, no matter how temporal they are. Even though college is a place of temporary establishment in our overall life cycle, a place for us to at some point leave and form new, different or join other communities, practices and rituals – by simply being a place of congregation it provides us an excuse to form connections with one another. Especially since school is also a place for business and professional connection, as well as social and (potentially) familial connection. Performance Context: According to my informant, the story was told to her by her two friends who are of Chinese and Vietnamese descent. However, she claims that it is a fairly common and famous online example of Korean comics on the internet, especially in horror circles. Main Piece: The story is based on the 2002 suicide of a woman in South Korea. It is a comic that tells a ghost story supposedly based on true stories about the ghost of this woman who haunts an apartment complex in Bongcheong-Dong. According to the informant and the comic, the woman supposedly killed herself because she was being separated from her daughter due to divorce. In the story, a young girl is on her way home as she heads to the apartment complex. Along the way she encounters a strange otherworldly woman whose joints seem “twisted every way”. The woman demands that the girl tell her where her “baby” is, upon which the girl, too scared to know what else to do, points a random direction to send the woman. The woman then goes off in the direction that the girl points. The girl tries to run away at this point, but soonafter hears a scream from the direction of the woman, having discovered that nothing was in that direction. The woman quickly rushes the girl, and the girl awakens to find out that her neighbors found her passed out. The comic is interwoven with two jump scares and sound in order to complete the experience. To the informant, she wonders whether this story is really based on true stories. It seems to be derivative, but according to her, the story was made for a contest. This puts into question the authenticity of the stories origin and whether or not it had actually come from oral traditions. The suicide is supposedly real, and the rumors of the spirit seem to be true, but if they were not, it would not be hard for my informant to believe. My informant is mainly interested in the story because of how it is meant to be spread to others as a sort of game. It is a viral comic that you want to show your friends because then you can watch as they are horrified as well. It is a sort of bonding that is made by spreading the story. In some ways, the story works in the same regard as many oral campfire traditions in uniting and making connection with others through the oral act of storytelling. My Thoughts: I think it is interesting because of the reasons that the informant explicitly stated. Storytelling is generally regarded as a form of communication and there is no reason that the discourse of that story cannot also be a way to communicate with others. The horror of the comic serves as a sort of initiation to a inner circle of those that have experienced it versus those that have not and whom can be spread to. There is a special bond formed through the esoteric knowledge of the experience. Performance Context: According to the informant, she was told this story a few weeks ago by her friend while they were camping. She then while listening remembered her own version of the stories. The two stories ended slightly different. To the informant, it’s just a scary campside story. It’s scary because of the idea of a strange person licking your hand. It’s a fear based out of the idea of invasion of privacy. My Thoughts: I think it is interesting because it talks a lot about how Americans often play this thematic motif of invasion of privacy. It derives out of our inability to cope with the idea, in a world that people find perhaps more confusing as information spreads, that there might be people in the unknown that may do unspeakable or strange twisted acts that disrupt our natural understanding of social boundaries and cultural rules. It’s an extension of the fear of the unknown as well as xenophobia. NOTICE: This is the “same” folklore I reported in my Hitori Kakurenbo, but told from a different completely unrelated informant and using a slightly different series of steps. It is most interesting because they learned about it through hearsay rather than through media like the first informant. I will list what is the same below and then follow with a list of discrepancies between the two stories. Performance Context: According to my informant, the story was told to her by her two friends who are of Chinese and Vietnamese descent. They are not Japanese, but due to their Asian heritage they may have had contact with the original story to some degree. They described the story as of “probably Japanese or Korean” origin. Main Piece: My informant described a strange sequence of rituals that is played by presumably young people who enact a “Bloody Mary”-style ritual to play hide and seek with a demon. You must complete a series of ritualistic actions in order to play with the demon through the medium of a doll. Again, like the original/prior reported, you first take a doll, name it, and you must fill up a bathtub with water. You are also again supposed to play alone and with all the lights off (though the informant did not mention electronics like the prior reported). After this, there is many discrepancies in the story. Firstly, the doll is supposed to be something like a Teddy Bear, because you should not (according to the informant) use a human doll. Anything with limbs will do. Then you cut it open with something sharp, not necessarily a knife. In fact, it’s not recommended to be a knife as the doll is said to stab you with it (similar to the prior reported story). Next you must fill it with rice. After this, you have to put something of your body within as well. It can be fingernails or a drop of blood, but either way it must be from you. Then you have to sew it back up with red thread. You then stab the doll. You find a hiding spot. You put the teddy bear in the tub (as prior) and then you go hide. Then, the ending is similar to the other. With your knife, you go back into the bathroom, the teddy bear shouldn’t be there. Then you have to find it and then you have to stab it to kill it. The informant thinks this type of supernatural event could be real. She did not know whether it was real or not, but she wouldn’t want to try because she wouldn’t want to find out. She seemed afraid and avoided eye contact with me a lot during her description of the story. This is very different from the last informant who previously described it as “psychotic”. My Thoughts: I think it is interesting because it shows how there are different modes through which stories can be passed. Sometimes they are passed through authored and derivative work, and other times, hearsay and the internet spread the stories to the point of becoming beyond recognition of origin. This new story even used a specific non-Asian doll as the main centerpiece rather than a more traditional doll. It is really interesting to witness the multiplicity and variation myself, as I asked these two informants to separately provide me some folklore, neither of them knowing one another nor knowing they would tell me this story. Background: My informant is a young screenwriter born and raised in California. She is a USC graduate in the screenwriting program. Currently she works on contract as a writer for several projects such as comics, television and podcasts. Main Piece: My informant described a strange sequence of rituals that is played by presumably young people who enact a “Bloody Mary”-style ritual to play hide and seek with a demon. You must complete a series of ritualistic actions in order to play with the demon through the medium of a doll. You must play this game alone, at night, and with all lights and electronics off. First, you take a doll and name it. You fill up the bathtub with water. You say “for the first game, I’m going to be it”, drop it into the water, and then you run away. When you come back, you say “I won” and then you stab the doll three times and leave it in the bathroom. After that you put the doll down in the bathroom, you hide and you wait. After that the urban legend has a few differences depending on the account. In one, you seek out the doll. Basically, after some time, you get up and you look for the doll. If done correctly, when you seek out the doll it will no longer be in the bathroom. When you find it, you must say “I win” three times in a row. If you do not do the ritual correctly, supposedly the doll will find you instead and stab you three times, killing you. Another version has you instead of finding the doll, waiting in your hiding spot until sunrise, upon which then you chant “I win” three times in a row. Either way, to end it all, you are recommended to burn the doll. Many people recount that they still feel strange or feel that their home is haunted even after the ritual. There also varying accounts of use of salt in the story. The informant said that she has heard a few different usages, but the one she learned about was when you are hiding, you are supposed to put salt in your mouth. Others talk about putting salt in the tub and such other usages. My informant thinks that it all is super creepy because they are strange in their own act because “why would someone do something like that”? Performance Context: According to my informant, she learned the story while translating the manga version of Occultic;Nine, a Japanese manga. During the manga, they make reference to several supernatural events come to life. Wanting to know more and understand the context, she explored the story herself and has been recounting it to her friends since. Background: My informant was young Caucasian man who was born and raised in Sioux Falls, South Dakota. He currently attends the University of Sioux Falls for Biology and History. Main Piece: My informant told me about the story behind a historically recognized landmark of Sioux Falls. There is a obelisk that stands just outside of city limits that marks the place where supposedly the origins of the city originate. The story goes that when the first settles came to the area they were not accepted by the local Native Americans. As Judge Amidon and his son were out hunting, the son went one way away from his father. The son was found by the local tribe who killed him. They also hunted down the father and killed him with his own rifle. The local settlers at the time found out when they found their bodies. They buried them under a mound where the obelisk was marked. After this, the local town was evacuated. Soon after, the town was attacked by the same tribe who killed Amidon. They say that everyone would have died on that day if not for them being killed. A few years later, the settles came back and the town of Sioux Falls was formally founded. However, the tricky part is that, the bodies of Amidon and his son were never found again. An archaeologist was hired to examine the mound where they were supposedly buried, but their bones were never found. A couple other locations were also searched, but there was no definite finding for the duo. Thus, the story’s authenticity has been put into question. It is mostly important and memorable for the informant because they think we should see this as a way to see how we should inform our native/white relations today. The history has value to people and he thinks that this can be used to inform rather than showcase tyranny of the past. He has been thinking about writing a histographical paper on this subject for some time. Performance Context: According to my informant, the informant’s mom was an aficionado of the occult, so she would tell her son (the informant) stories like this. He also knows about it through the historical plaque that is in front of the obelisk. The informant thinks he was taught the story to talk about Sioux/settle relations in the past, specifically to highlight how poor they were. My Thoughts: I think it is interesting because it shows how we form significance and superstitious regarding our own creation myths for not only the world, but even our towns. The origins of Sioux Falls may go somewhat unrecorded because all we have to go off of is the words of a few would-be settlers at the time. However, the effect is strong enough that whoever is in charge of marking historical landmarks in South Dakota has gone to the trouble to even put up a official plaque that is used on various other landmarks in town. It is even given the name “Amidon Affair” to commemorate the story.